I enjoy cooking cuisines of the world and love how each cooking style relies on just three aromatic ingredients that sets the cuisine apart, establishes the flavor base of the dish, and defines that cuisine. 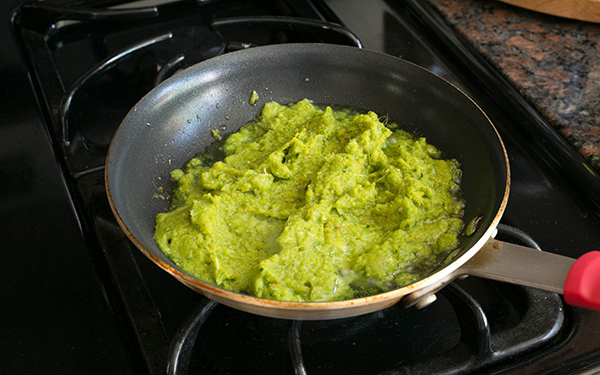 The French have mirepoix which is carrots, onions, and celery; the Cajun South have Holy Trinity which is onions, bell peppers, and celery; the Chinese have ginger, green onions, and garlic. In Southeast Asia in the region of Malaysia, Thailand, Singapore, and Indonesia where I was born, the Kaffir lime leaf, lemongrass, and galanga ginger root are the three-ingredients that lend an unmistakable aromatic and exotic flair to dishes from that region of the world. I'm fortunate that I live in Los Angeles so it's easy to get fresh Kaffir lime leaf, lemongrass, and galanga. 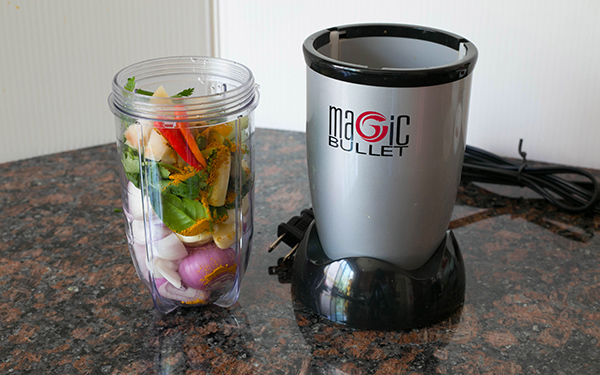 If you don't have access to these ingredients, you could use lime zest and garlic in place of the Kaffir lime leaf and lemongrass, and ginger in place of the galanga. 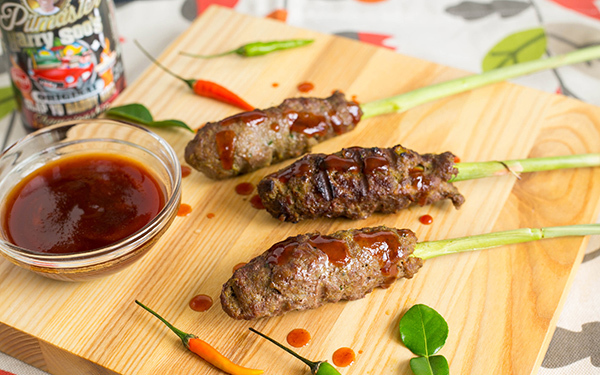 Instead of the lemongrass skewers, you could also use flat metal skewers and grill your ground meats kebab-style. 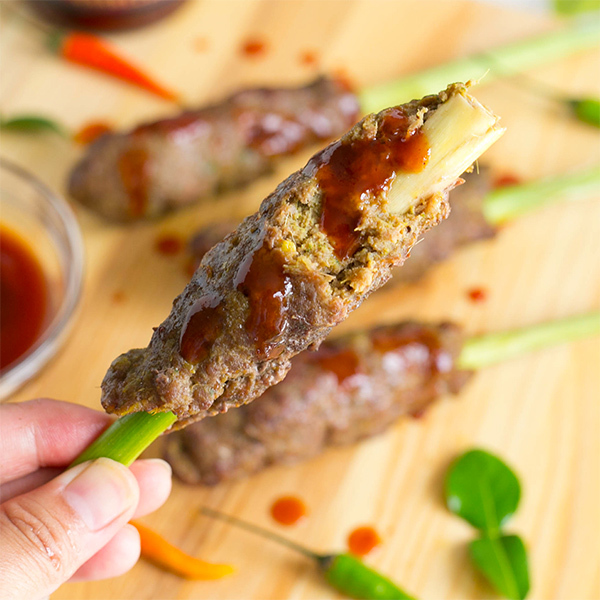 A great way to showcase these Southeast Asian "kebabs" is at your next tailgate party or when camping. 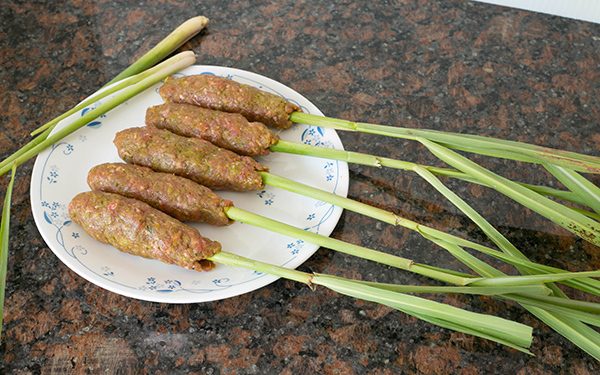 In this recipe, I used ground beef on lemongrass skewers but you could do the same for ground pork or ground chicken. You prepare these ahead and store them in a plastic zip bag and pop it your cooler. 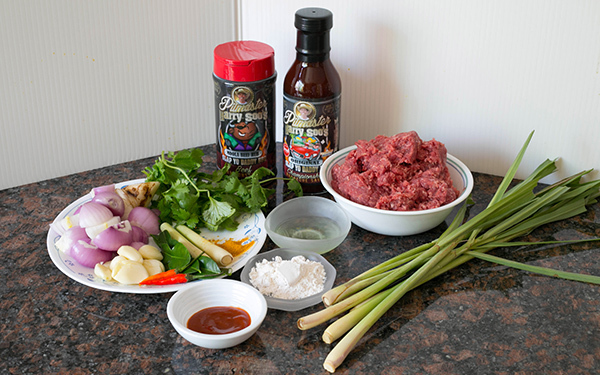 When you get to your tailgate site or campground, you just toss these beef appetizers on your grill and they are done in 10 minutes or less. Once you make them for family and friends, you'll find it will be their number-one request. 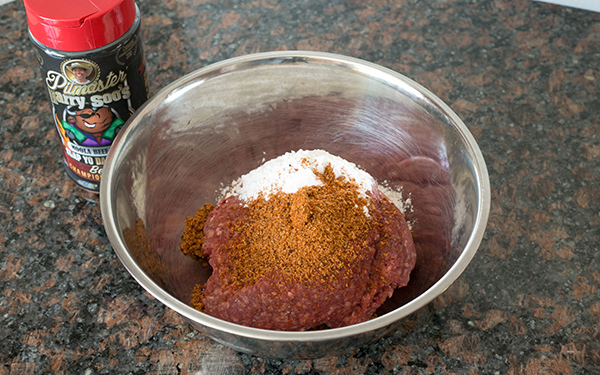 Grind spice mix in processor into a coarse paste. 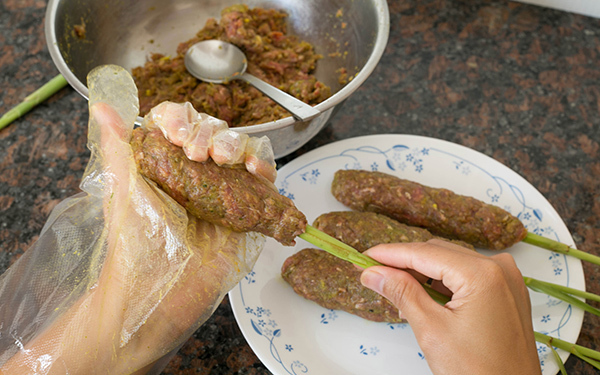 Mound the ground beef mixture over the stalk area of the lemongrass into a 4-inch sausage shape. Leave 1 inch of the bottom stalk exposed. Repeat until your meat mixture is used up. You can make your sausage shape thick or thin but I think it tastes better thin. 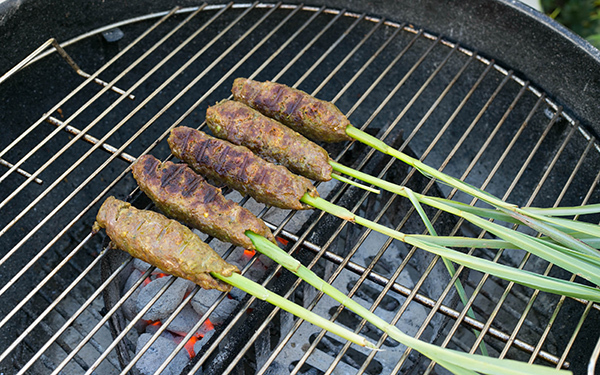 Refrigerate the skewers for 30 mins or more so they will hold together better when you grill them. 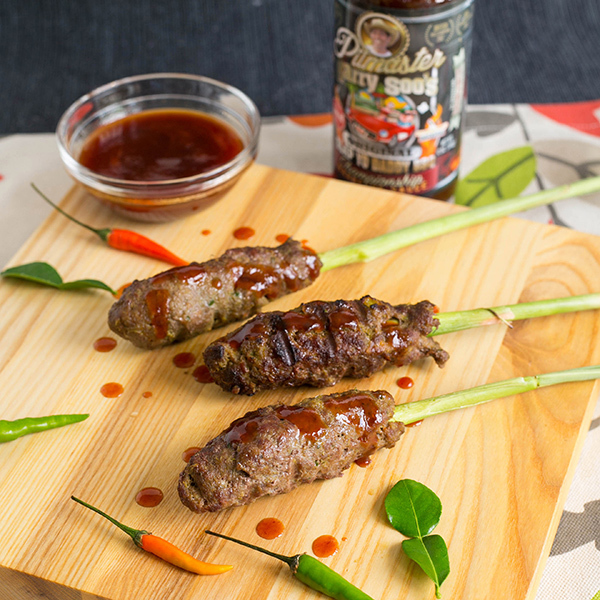 I love the idea of lemongrass skewers.